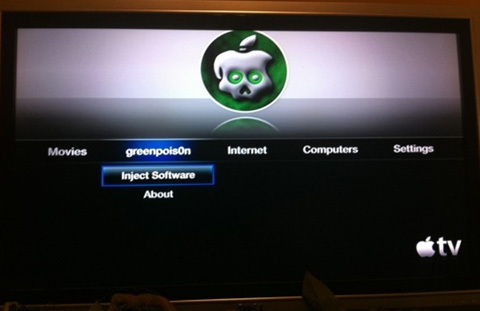 It was expected to happen any time and finally the Chronic Dev Team has successfully achieved Apple TV 2G jailbreak with limera1n exploit based Greenpois0n tool. The dev team posted an image of a jailbroken Apple TV as a proof which very clearly shows a custom loader with a background on the Apple TV, running iOS 4.1. The jailbreak is yet to become public but it is proved that it’s now possible to jailbreak the latest Apple TV device. The dev team is reporting fast progress and promises that it won’t be long before users can jailbreak their devices themselves using Greenpois0n with just a click. This obviously means that now there is a whole world of new opportunities for Cydia developers to create some apps for the $ 99 set top box. There are a huge number or popular apps, softwares and games that users would love to be able to run on their devices and now it’s all looking not so impossible after all. Greenpois0n is one of the hottest jailbreaking tools around currently as it covers a wide range of Apple products and is reported to be much quicker, easier and more effective than most other tools by users. The next step is obviously getting some apps up and running on our Apple TV devices and who ever achieves this feat first will once again be the king of the hackers community. Let’s wait for the jailbreak to become public and the Chronic Dev Team to do its magic once again.